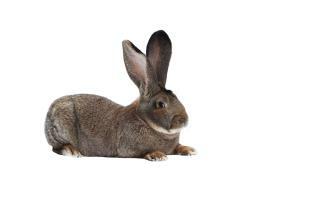 (Newser) – United Airlines' latest headache is a 3-foot-long one: A giant rabbit traveling from London Heathrow to Chicago's O'Hare was found dead in the cargo hold upon arrival, though his owner tells the Sun a pre-flight vet's check revealed Simon was "fit as a fiddle. Something very strange has happened and I want to know what," says Annette Edwards. "I've sent rabbits all around the world and nothing like this has happened before." Things like this do happen, though, but rarely, reports the BBC. It cites US Department of Transportation data that shows 35 animals died in the course of air transport in 2015. Of those, United was responsible for the most of any US airline: 14. I thought it was going to say that one was sent but four showed up. Simon was headed for Norwalk, IA. The owners of some company thought they would buy him and show him. They got the idea from seeing all the huge animals winning 'Best' ribbons at the Iowa State Fair. That seems like a terrible business plan.